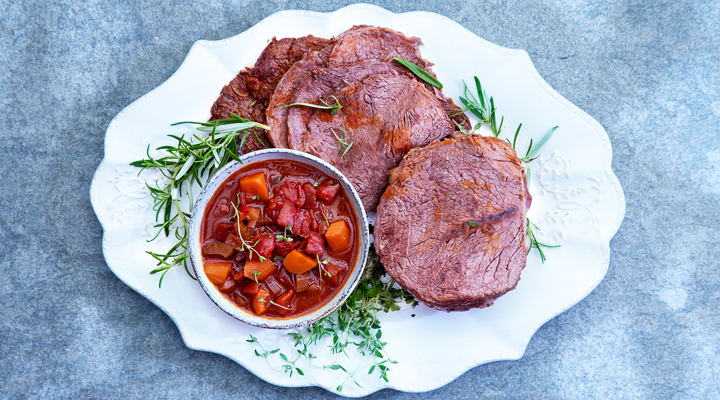 This dish is a twist on the classic Sunday Roast, sure to be enjoyed by the whole family. Put the dried mushrooms in a bowl, cover with the warm water and leave to soak for 10 minutes. Put the flour in a large bowl and season well with salt and pepper. Add the beef and toss to lightly coat with the seasoned flour. Heat the oil in a casserole set over a medium-high heat. Add the beef and sear for 3 to 4 minutes, until coloured on all sides. Transfer to a plate and set aside. Add the onions, carrots, celery, garlic and herbs. Cook for 2 minutes, stirring occasionally, until the vegetables soften slightly. Add the tinned tomatoes, red wine and tomato purée and bring to the boil, then reduce the heat to a simmer. Pick the mushrooms out of the water and rinse them under the tap to remove any leftover grit, then give them a rough chop. Add the mushrooms and their soaking liquid to the casserole, but take care not to pour in any grit that may have settled at the bottom of the bowl. Add the beef back to the casserole and pour in enough stock to cover the pot roast. Place the lid on the casserole and continue simmering for 5 minutes, then transfer to the oven and cook for about 2 hours, until the meat is completely tender. Remove the casserole from the oven and leave to settle for 15 minutes. Remove the pot roast and cut into slices. Serve immediately with the vegetables and cooking juices. Tip: Replace the dried porcini mushrooms with a forest mushroom mix as an alternative.